Since his introduction to the game of golf by his father at the age of eleven, Dan Schlegel has been enveloped in the intricacies surrounding the greatest of our games. Shortly after picking up the clubs, Dan quickly became a single-digit handicap player, playing at scratch for one season. By the age of eighteen he had won the Club Championship at his home course and realized that his deep love of playing the game could be combined with his fascination of the playing fields of the sport. This led him to Penn State University to obtain a Bachelor of Science degree in Landscape Architecture. Shortly after graduation, he was hired by one of the most prolific golf course design firms in the country. Dan traveled and worked on golf course designs through most parts of the United States, Canada, and Korea. He also learned the fine details of his craft from three presidents of the American Society of Golf Course Architects. 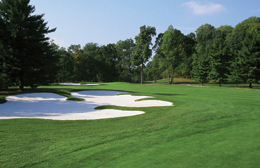 Since his involvement in the industry, Dan has gained experience in all areas of golf course architecture, been associated with over 40 new golf course facilities, over 25 renovation projects, and numerous other feasibility studies, preparation of construction document packages, and presentation. With nearly two decades of experience, Dan now presides over his own company - Schlegel Golf Course Design. The firm is capable of working with and coordinating a team of design professionals to complete both small and large scale projects. It is connected to other leaders with the golf course industry and is familiar with the nuances of bringing a project from concept to opening day. This ability to determine the comprehensive nature of each project results in the execution of multi-million dollar contracts on schedule and within budget. The firm believes that the industry is on the verge of a shift in the ideological approach to the profession. Gone are the days of golf course design where formulaic design principles are implemented. The next generation of great golf course architects is committed to thoroughly analyzing the proposed golf property and its natural systems, and applying site sensitive solutions to create the ultimate experience - both in terms of aesthetics and designing for the modern game. Schlegel Golf Course Design is dedicated to practicing modern golf course architecture at this highest level, while respecting the traditions of the game.